At first glance, Christopher LaPel’s (MA ‘94) life seems fairly ordinary. He loves God, is committed to serving the Lord, and is a leader of two dynamic ministries. "My heart just wants to share our Lord Jesus Christ," said LaPel. Make no mistake, though – there is nothing ordinary about Christopher LaPel. Born in Cambodia, Christopher was a young man when the Khmer Rouge assumed control of the country and began executing people in what became known as the Killing Fields. His parents and siblings were among the over 1.7 million people killed by the Khmer Rouge and, though he was not yet a Christian, he believes it is only through the grace of God that he survived. After accepting Christ and moving to the U.S., Christopher was committed to serving wherever God wanted him. In his heart, he knew he was called to be a church planter, so he founded Hope for Cambodia (HFC), through which he travels semi-annually back to the country where he lost his family, friends, and classmates, in order to preach about Christianity. While he admits it is emotional and difficult to return to Cambodia year after year, his trust in the Lord provides him with the strength he needs. Christopher’s faith has often guided him through challenges. 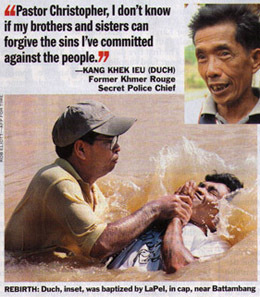 In 1995, he ministered to and baptized a man named Hang Pin. It was not until 1999 that Christopher learned that Hang Pin was actually named Kaing Guek Eav, better known by his revolutionary name, Duch. This man had been the head of the Khmer Rouge’s secret police and was believed to be personally responsible for the deaths of at least 14,000 people. After Duch was discovered and imprisoned for his crimes, ten years passed before Christopher saw him again face-to-face. When they met once more, Christopher did not spew words of hate or anger. Instead, Christopher, a man who had barely escaped death at the hands of people like Duch and whose family had all been victims of the Khmer Rouge, looked Duch in the eye and said, "I love you and I forgive you." He explained that forgiveness is never easy, but that we must love and forgive one another as God forgives and loves us. Shortly thereafter, in September, 2009, his faith was on full display when Christopher was called to testify in court during Duch’s trial. Though it might have seemed frightening or imposing to someone else, he was thrilled to have the opportunity to preach Christ’s message to so many people at once. During his testimony, Christopher spoke for an hour and a half about Christianity and Duch’s faith, while lawyers, the judge, and more than 500 spectators listened. "It was a blessing," he said. In fact, it was only one in a series of blessings. After the story of Duch’s conversion became international news, the Cambodian government began working more closely with HFC. Since then, the ministry has essentially had an open door to plant churches that are officially recognized as Christian organizations by the government. Neither HFC nor Christopher is spending time worrying about when – or if – that door will close. Instead, they continue to work hard, taking Christianity to a group of people who, Christopher says, have never heard of the love of Christ or the goodness of God. HFC continues to grow and has already established more than 150 churches in Cambodia. Christopher is grateful for the many people and groups who support HFC’s ministry efforts, especially Golden West Christian Church, where he serves as a senior pastor. He also specifically acknowledged and thanked Hope International University, where he earned his Master’s degree in Congregational Leadership. "Hope is a place where I was given the opportunity…to prepare myself to serve the Lord," he said. He draws upon that preparation and the resources of his congregation regularly in his diligent work with HFC. The organization persists in spreading the gospel, as the Khmer Rouge tribunals have rendered leaders of the radical communist group guilty. Christopher expresses mixed feelings on the topic of the tribunals, believing the trials serve an important purpose in "helping the Cambodian generation to learn right and wrong, but it won’t give any healing or hope," he said. "That will only come from God." To learn more about Hope for Cambodia and Christopher LaPel, click here. "Hope is a place where I was given the opportunity...to prepare myself to serve the Lord,"